However, Apple's design office hasn't always batted 1.000. If you're a Mac veteran, you may recall (however much you've possibly tried to forget) the unfortunate Flower Power and Blue Dalmatian G3 iMacs from 2001, which were arguably most bizarre lapse in Apple's usually (but not always) impeccable elegance in styling and design. "At that time of night, out here in the boonies, silent except for the Northwest wind whistling around the eaves, a sense of the surreal tends to set in, so the fact that I was confronted with what looked like one snow iMac that someone had stuck an appliqué of flower patterned MacTac over, and another that appeared to be suffering from some sort of dread skin disease, registered in the way such incongruities do when in a dream state." Even at night, the Blue Dalmatian model struck me as especially ugly. I went back to Apple's website the next morning to make sure it hadn't been a nightmare. It wasn't. There they were. I called my wife to have a look. She loves floral patterns, so I thought that she would be a likely candidate to give a stamp of approval to at least the Flower Power machine (if anyone was). She didn't think it was utterly horrible, but she wasn't overly enthusiastic either, and with no coaching from me also came up with the analogy that it looked like flowered MacTac. Actually, the patterns were embedded in the plastic, and the patterns did turn out look considerably better on the actual machines than they did in pictures, but I still think that the spotted iMac looked like it had an illness you wouldn't want to catch, and that Flower Power resembled something one might have found painted on a Volkswagen microbus thirty years earlier. Speaking of which, VW is shamelessly exploiting boomer nostalgia for the old VW van with a TV ad campaign here in Canada for its new 2009 Routan minivan. It's cleverly done, but a bit over-the-top with the "German engineering" brag when the Routan is based on Chrysler's minivan, uses Chrysler's 4.0 litre V6 engine and six-speed manumatic transmission, and is built in the same Chrysler plant in Windsor, Ontario. It's doubtless a vastly better vehicle than the old VW transporter/microbus was back in the 60s. I spent a fair bit of time in VW vans back in the day, and they had their virtues, but a lot of vices as well, such as anemic power, dodgy road holding, especially in crosswinds, and dismaying tendency to catch fire. Pardon the digression. 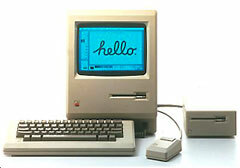 Back to Apple styling: Macworld referred to the Flower Power iMac as "Pokemon Vomit". 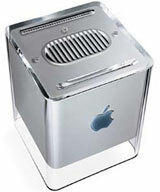 MacMonkey's David Egger entitled his commentary on these units, "Honey did you puke on the iMac?" The MacMind's Dean Browell observed: "I swear to you when I saw the iMac collage of Graphite, Flower Power and Blue Dalmatian colors I thought it was a joke site. Damn these things look like a Swatch Watch threw up." "The new iMacs are horrible. It's a complete disaster. Apple is finished. I am not going to say anything for as long as I can, hopefully forever. 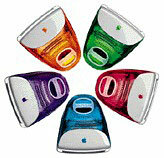 Once I start saying what I really think about the new iMac colors, I'll never stop. The press tomorrow will be unmerciful, of course. Apple is finished. It's the end of an era. You can't even run OS X on the new machines without adding RAM yourself. What a joke. " Well, it didn't turn out to be nearly that bad. Apple discontinued the Flower Power and Blue Dalmatian six months later - after understandably poor sales - and the iPod intro was just eight months in the future, but there did seem to have been a lapse of judgment (even sanity) at Apple. 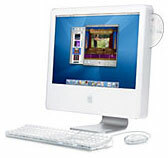 The "earth tone" iMacs (indigo, sage, ruby, and snow), introduced in July 2000, had been up to the high water mark of good taste in iMac styling, The original Bondi blue iMacs were subdued and reasonably attractive, althoguh I didn't really care for teal. I didn't particularly like the fruit colored models introduced in January 1999 either - they always seemed bit frivolous and loud. On the other hand, I really liked the snow and sage iMac models. At least the popular indigo and Apple's signature graphite colors were still available as respectable alternatives to Hippie Dippy and Cruella de Vil - and outsold them handily. What caused Apple to drop the ball so stunningly is an enduring conundrum, the cause of considerable befuddlement as to how the same styling department could turn out something as understatedly elegant as the contemporaneous G4 Cube and as overstatedly hideous as the "Flower Power" and "Blue Dalmatian" iMacs inside of a six month period. Apple's style sense has typically been the best in the industry, and while Flower Power and Blue Dalmatian were a worst-case slip, it's not to say that Apple has not made other styling missteps from time to time. Style is, of course, a tricky thing to critique, because it is always to some degree a matter of subjective taste, and there are few purposely styled objects that cannot claim a least a few aficionados, be it only the stylist and his or her mother. However, I believe that there is such a thing as objectively good or bad taste, elitist as that may sound to some 21st century ears. For example, I would vigorously contend that Beethoven's Ninth Symphony is a much more tasteful work than Elvis Presley's "You Ain't Nothin' But a Hound Dog", both aesthetically and on the basis of its musical depth and complexity. Taste must also be appropriate to context. For example, Beethoven's Ninth would not be a sensible choice for the playlist at a bachelor party or beer bash, while Hound Dog or other popular ditties of the same genre would be entirely suitable. In terms of style, and focusing in more closely on the central theme of this discussion, it would be bad taste to paint, say, a Bentley Brooklands bright canary yellow, but that color suited to a T a 1968 Dodge Super Bee a friend of mine used to own. Context, as I said, is key. And so it was with the Flower Power and Blue Dalmatian iMacs. Right now, by happenstance, I am looking at one of our family's towels, which has a flowered print motif not unlike that of the Flower Power iMac. It is a very attractive towel, one of my favorites, in fact, but I wouldn't want that print decorating my computer. There have been too many Apple models over the past 21 years to do an exhaustive breakdown, but here are what I consider the most notable examples. I expect there are many who will disagree with my categorizations, but that's the way I see it. Not to say that the homelier ones were or are necessarily bad computers functionally. My awkward-looking Mac LC 520 served me well as a faithful workhorse. If you're a regular Low End Mac reader, you know I'm a consummate fan of the G3 Series PowerBooks, especially the Pismo, but I've never been especially smitten by their styling - their charcoal-black color, Coke-bottle waisted cases, lozenge-shaped trackpad buttons, and rubbery-plastic appliqué on the outer contact surfaces. I prefer the slimmer Lombard and Pismo to the hulking WallStreet looks-wise. The latter did have the advantage of two PC Card slots and more versatile dual expansion bays, however. The dual-USB iBooks, metal PowerBooks and MacBook Pros, and the MacBook are all much better-looking, although not functionally superior with their slim to razor-thin cases. Interestingly, proportion can have a lot to do with it. The PowerBook 5300/190 and the 12" iBook have roughly the same footprint and length-depth dimensions, and I've always found both pleasing to my eye. 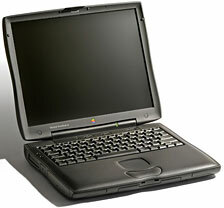 On the other hand, the PowerBook 3400c/3500c models used essentially the PowerBook 5300 styling and even some of the same plastics, but stretched the depth to accommodate a CD-ROM drive while adding a bulge to the lid to fit in a "subwoofer" speaker. The 3400/3500 were excellent computers - vastly better than the 5300 - but they were ugly ducklings. Pretty much the same applied to the two sizes of dual-USB iBook. 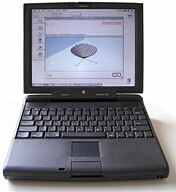 The original 12" dual USB iBook was elegant and beautifully proportioned. Stretching the same styling to accommodate a 14" display made it mediocre-looking at best. On the other hand, the aluminum PowerBook/MacBook Pro design has proved to be quite successfully adaptable to resizing, and I think all four form factors (six if you separate the slightly deeper MacBook Pros from the PowerBooks) look elegant and attractive. Sometimes materials and livery can make the difference. I always thought the G5 iMac/early Intel iMac was ungainly looking in white plastic (and I usually like white computers) due to the disproportionate expanse of white "chin" area below the display. However, the newer aluminum iMacs - which have pretty much the same basic styling but in an aluminum housing and with a glass cover over the display and other iPhone-esque styling cues - looks positively fetching to my sense of aesthetics. At least that's my taste. Yours may differ, and I'd be interested in hearing your Apple product styling critiques in the Miscellaneous Ramblings Mailbag. Attractive and ugly Macs, discontinued MacBook Pro value, and writing with TextEdit, 2008.10.30. 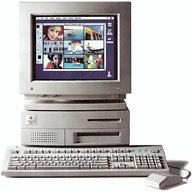 Readers weigh in on the good, the bad, and the ugly of Macintosh design over the past 24 years.